Spray a 9×13 inch baking pan lightly with non-stick cooking spray. Press one-third of the dough evenly into the pan to form a bottom crust. Wrap remaining dough in plastic wrap and chill in refrigerator. Once the caramel is melted add in your ½ tsp vanilla and stir until combined. 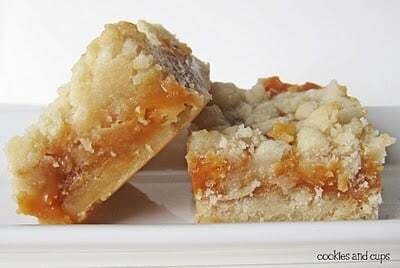 If you want thicker bars, double the recipe!